My aim with this article is to outline, with facts, large global structural issues that I believe everyone, bulls and bears alike, should be fully aware of. While some of this discussion may rattle the cage a bit you will hopefully find this article well researched and informative. Recently I’ve outlined why we switched our trading stance from buy mode (Door Shut) to sell mode (Inversion) on stocks. 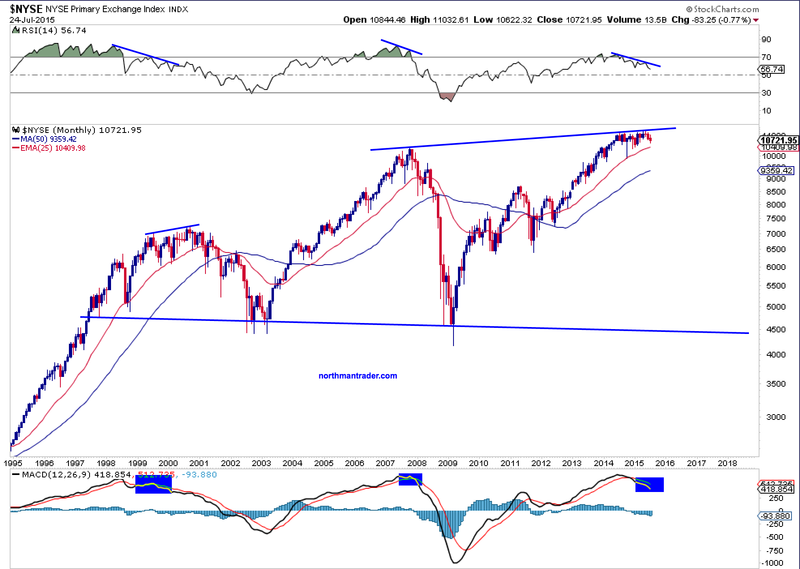 This week I’ve also outlined the aggregate technical factors that have us very cautious on stocks in general (Totality) while not precluding the possibility of new highs. This article, however, will focus on much larger structural issues that have been building for years, decades indeed. And no this article is not so much about central banks, debt issues, Greece, China, deficits, etc. While all these are important as part of the overall picture, they are mere current symptoms of a much larger issue that is at the core of all that is already in play and will only deepen in our societies in the decades to come: Institutionalized poverty with an ever widening divide between the haves and the have nots which will result in an eventual drastic revaluation of asset classes across the board. And before you think I’m off on a hyperbolic rant let me assure you my reasoning will be very much fact based and I have reason to believe the US Fed and Janet Yellen are very much aware of it all, but have no solution to prevent it from happening. In fact it is mathematically unavoidable. A few weeks ago in The Greek Butterfly I discussed the concept of a global math construct that needs to maintain its integrity to make global debt serviceable. To that end I concluded that they would not let Greece default. After much scary talk and fluttering stock prices we now know the conclusion: Greece was saved yet again and new debt negotiations are under way. During the same time we saw China correcting hard and quickly the Chinese spent $800 billions dollars to prop prices back up. Again: Fighting symptoms, but not addressing a root cause gnawing at it all. And we have seen this need to rescue falling stock markets in action for years and indeed central bank intervention has only accelerated in 2015 with over 50 global central banks rate cuts and a new massive QE program launched, this time courtesy of the ECB. Why do you think they are all doing this and have been doing it for years? Decades even? The simple answer is they HAVE to. They have no other choice. And let me explain why. I’ll do so be telling you a story that starts with the symptoms, the larger trends we have all been able to observe. I’ll also throw in some factoids that may surprise and/or shock you. In short governments, globally, not only the US, have wildly overstated organic GDP figures and borrowed heavily maintaining the illusion of growth. The public justifications for these deficits: Usually a combination of “we must prevent a crisis or react to a crisis, and we need to cut taxes to incentivize businesses to create jobs and this will promote growth”. And future growth will justify the expense. The result: Huge sums of debt that need to be financed with debt service payments impacting the discretionary government budget. The truth: These debt service payments are only manageable via artificially induced low interest rates. At current debt levels the discretionary budget would simply buckle under normalized rates. 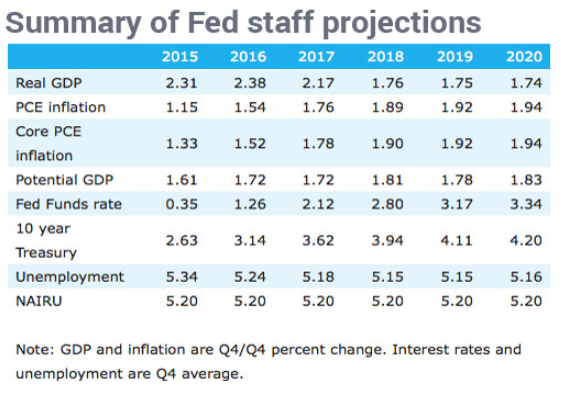 Note these projections above never see a recession coming and unemployment will forever improve while rates are rising for years to come. To which I say: Pure fantasy. Let’s address the employment picture and the quality of jobs and benefits. Hence it can be clearly stated that taking on debt and cutting taxes has not resulted in an aggregate increase in employment. The opposite has happened and employment peaked during the 2000 market bubble. But at least we have growth and people are making more money. Right? No. They have not recuperated at all, in fact median household incomes are at roughly the same level they were over 20 years ago. 1. During the previous drops in the unemployment rate in 2000 and 2006/7 real median household incomes had experienced a temporary spike. Not this time around. 2. Since the 1990s reaching low unemployment rates coincided with a “peak” in stock markets and preceeded recessions. More on this later. When the Fed under Ben Bernanke embarked on ZIRP combined with a massive bail-out and a QE program there was no stated intent or goal to have ZIRP in place for 7 years, no was there a plan for QE2, or QE3 nor did anyone envision we would still be in this place in 2015. So what went wrong? A number of things frankly and this is where it’s going to get really dicey. The root of the crisis this time was housing and people were losing their homes by the millions. But who was in more trouble? Financial institutions and they had to be made whole right? Mark to market was eliminated and banks had flexibility to make their balance sheets look sound when in fact they weren’t. Prices needed to rise to make the math work. 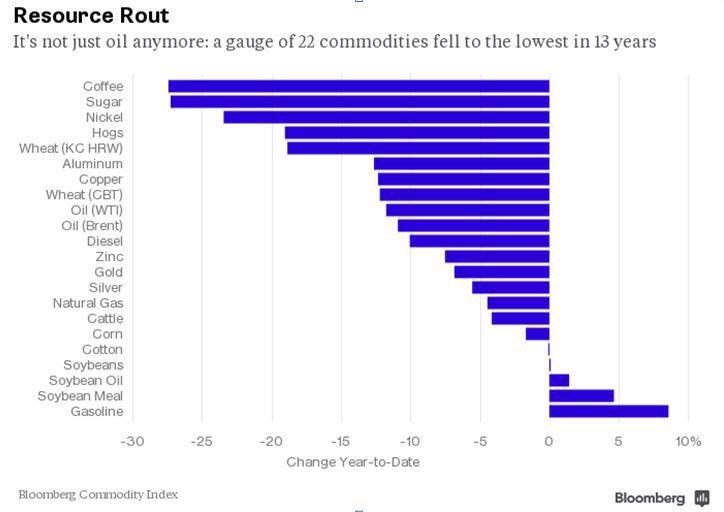 All thanks to zero rates. The premise was to rescue the financial system, to encourage lending, business formation and hiring to produce economic growth. Right? But that didn’t really happen. 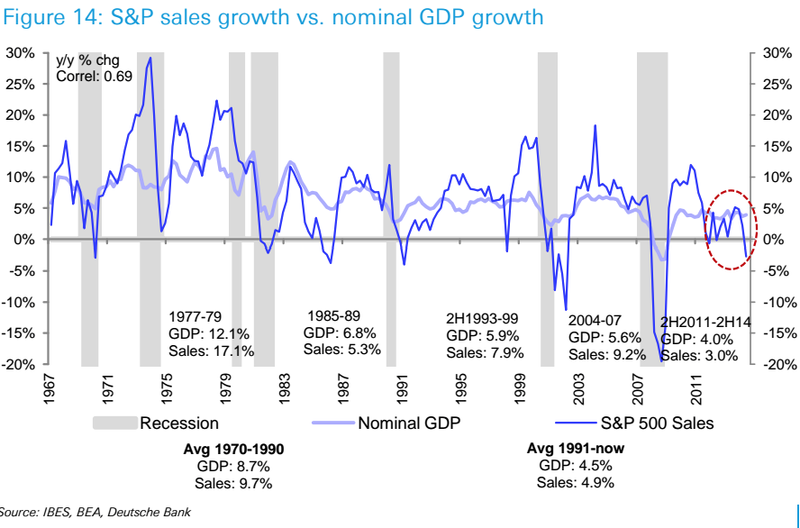 It happened on the surface, but a closer examination of the data leads to the conclusion that there is major cyclical downturn under way already. While zero rates have permitted many consumers to refinance their mortgages at cheap rates many others couldn’t. Most because they can’t afford to or they don’t qualify or both. And this is a problem because housing is still the largest expense line item in a family’s budget. 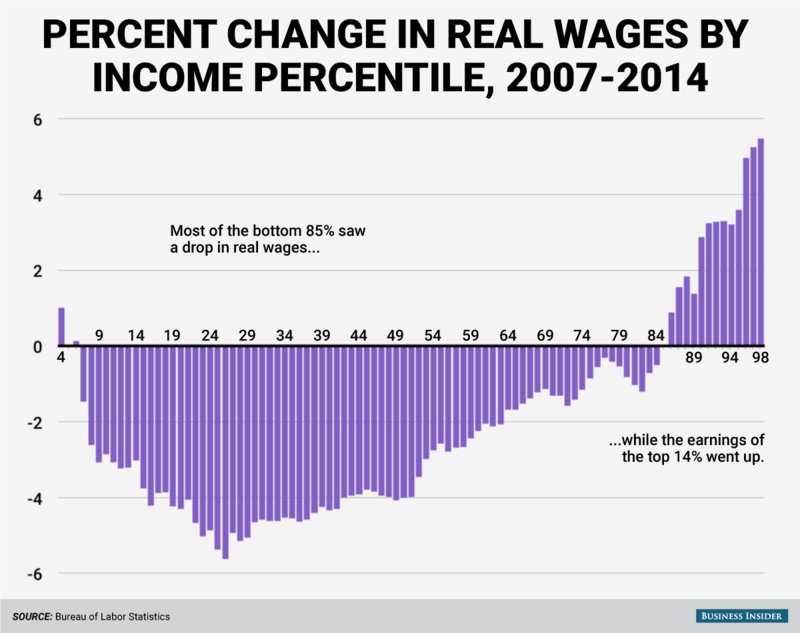 So flat out 85% of Americans have experienced negative wage growth since 2007 while housing prices have gone up. And many more Americans are no longer in the labor force as we have established. That’s a problem. I have the view that the hidden crisis in America that no one is talking about is what’s going to happen with all of these 20, 30, 40-year-olds who no longer have corporate pension funds of defined benefit. But baristas say Starbucks’ focus on profits and cost-cutting has increasingly led its leadership to tune workers out. Locke, who has worked for the company since 2006 and who earns roughly $16,000 a year, said she yearned for the Starbucks of old. So to summarize: Fewer people working overall, with 85% experiencing negative wage growth in jobs with little to no benefits and little upward income potential and no pension on the horizon while many are forced to indebt themselves and change their behavior to even have a shot at a higher education all while the cost of housing has increased dramatically. Any wonder retail sales stink? We were told that tax cuts would promote business expansion, zero rates would promote growth and lending and a new dawning of the day. Note goods producing firms continue to shrink and this also has ramifications and I address this further below. 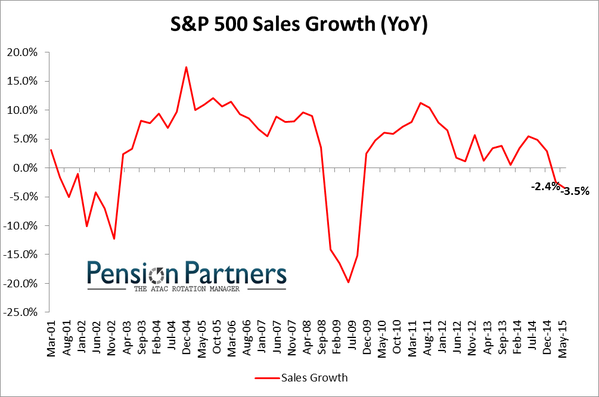 We never came even close to the growth of the mid 2000s and are continuing to see a regression in sales growth. Twenty-two percent of American children were living in poverty in 2013 compared with 18 percent in 2008. So a reasonable question may be: How are people who own nothing, who have been experiencing a decline in real wages and who are leaving the labor force in droves, ever to contribute to the economy at large? As in help GDP grow? Look I have no problem with Mark Zuckerberg and Jeff Bezos and others getting stupidly rich off of their business ventures, but there are only so many yachts, islands, mansions, jets and bling one can buy. Despite popular belief it does get boring. Hence many billionaires are already pledging to get rid of all their wealth when they die and fair play to them for doing so. But that doesn’t answer the larger question: How are all these trends pointing to a structural bull market? Why instead is this all pointing to a major bear scenario? She is hoping. Well good for her, but hope is no strategy and the plain fact is productivity growth is and has been regressive and without it there’s no growth, no wage increases and no inflation. Not exactly the stuff that economic expansion dreams are made of is it? First let me say that technology is awesome, it’s made our lives so much better in many ways and I wouldn’t want to live without it. Heck my entire livelihood centers around technology, but it is coming at a price and a heavy one indeed. For many years companies have sought to improve their cost efficiency by outsourcing jobs into other countries. 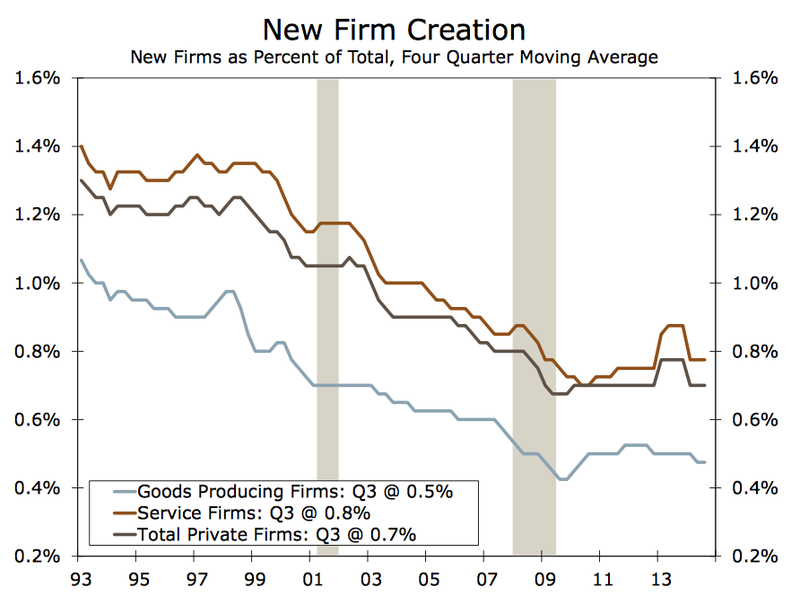 no problem with that, but it has created a structural shift and the slack is not being picked up within the domestic economy. Yet this trend accelerated after the financial crisis and took on additional forms, mainly: Do more with less. Companies laid off millions of employees and the original notion was they would hire them back when things would get better. They haven’t in many cases, hence the labor participation rate has shrunk. 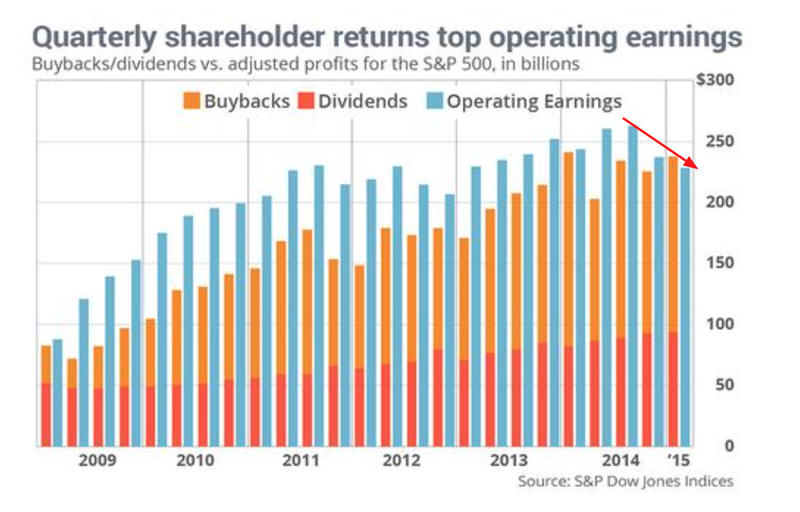 Instead what companies have found is that they can get away with fewer employees. Technology improved to the extent where this was possible. As manufacturing and production based companies took a second seat to the information economy greater scalability could be achieved. In fact unprecedented scalability. Hence a company like Facebook that reaches over a billion people needs relatively few employees. Hence small app companies can have billions in valuations but only have a few employees. In short: Massive wealth concentration in the hands of just a few versus a much more labor intensive economy in previous times. 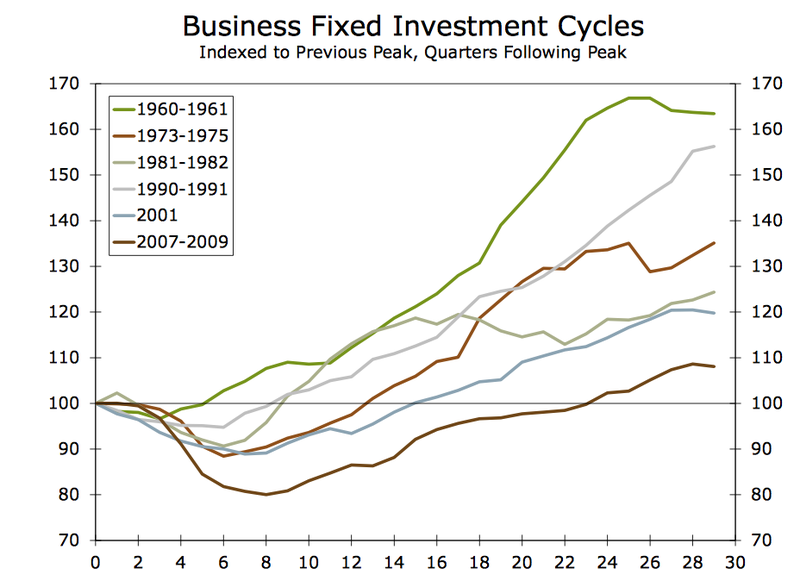 And, combined with an economy that invests less in capital investments, productivity growth appears to be limited for years to come. According to Brian Krzanich, the current chief executive of Intel, the era of Moore’s Law may be coming to a natural end. In a discussion with analysts on Wednesday night, he admitted that while his firm had “disproved the death of Moore’s Law many times over”, its next generation of microprocessors would take slightly longer to produce. The issue of course: Staying ahead of the innovation curve and frankly it appears $GOOGL glass and $AAPL’s Watch are examples of companies struggling to define the next big thing. Note Tim Cook was very shy on providing any details on sales for the Apple Watch during the recent earnings call. Niche product yes, applications that are new category defining? Not so much. Yes $AAPL will continue to generate massive earnings as a upgrade and product replacement engine. But it’s also vulnerable to regional issues as the China sales figures have shown. 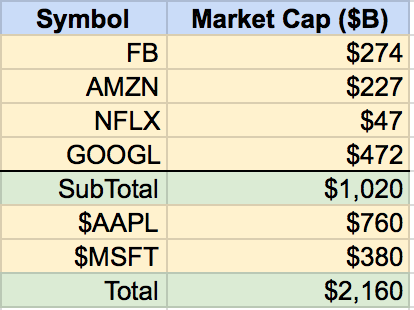 And if you have a market cap north of $700B you better come up with new revenue streams or you flat line eventually and your valuation falls. But there’s nothing compelling new on the horizon for the moment. Yes the screens get better, the memory gets bigger, the processors get faster, and even a better camera is coming. But that’s all cosmetic isn’t it? What is it I can DO with it that’s different? The next big thing? Tim Cook is hoping it’s the watch? TV? Cars? Really? Sounds like the rehashing of decades old platforms to me, improved, yes, repackaged, yes, but still the same old platforms. So this question remains unanswered for now and with declining productivity, a declining Moore’s law, and shrinking real wages it doesn’t take a genius to figure out why there are issues ahead. As much as I love technology there’s a real dark side to it all that concerns me deeply and it goes to the core of the question: Does it make for a better society ultimately. All the numeric data points above suggest that so far the benefits appear to be lacking. 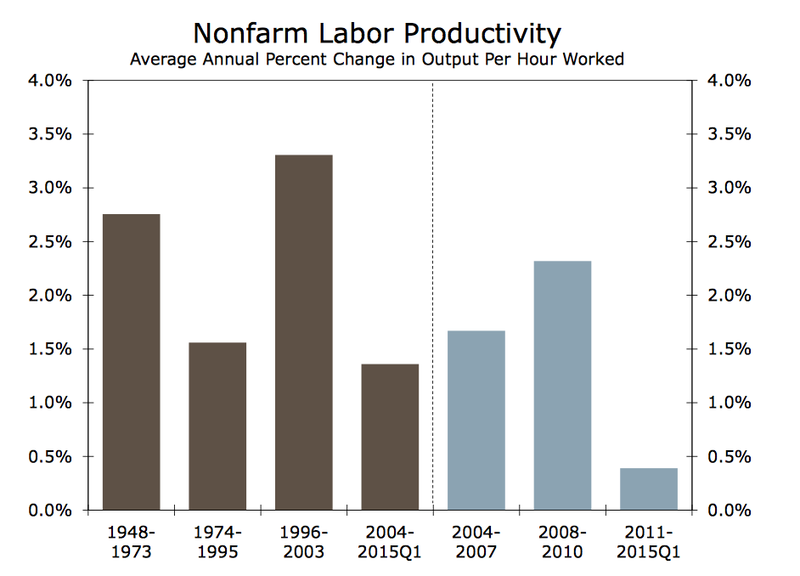 Wage growth, income inequality, GDP growth, employment availability, etc. all are pointing to a declining health in overall society. Yet technology provides more information at our fingertips than ever, the ability to get things done are unprecedented in human history. Frankly the tools available to us are fantastic! So there’s a dichotomy here. What’s the problem? It may come down to what people are choosing to do with the available technology and how and what companies are promoting to sell to consumers. Let’s first look at the actual result in terms of human behavior and it’s not pretty. An analysis published in JAMA Internal Medicine on Monday found that 75 percent of men and 67 percent of women ages 25 and older are now overweight or obese. That’s a startling shift from 20 years ago when 63 percent of men and 55 percent of women were overweight or obese. Facebook? Screen sucking for entertainment purposes. Sitting still. Amazon? Buy stuff with a mouse click, no need to move. Netflix? Watch TV on the couch, maybe with a burrito in hand. Google? 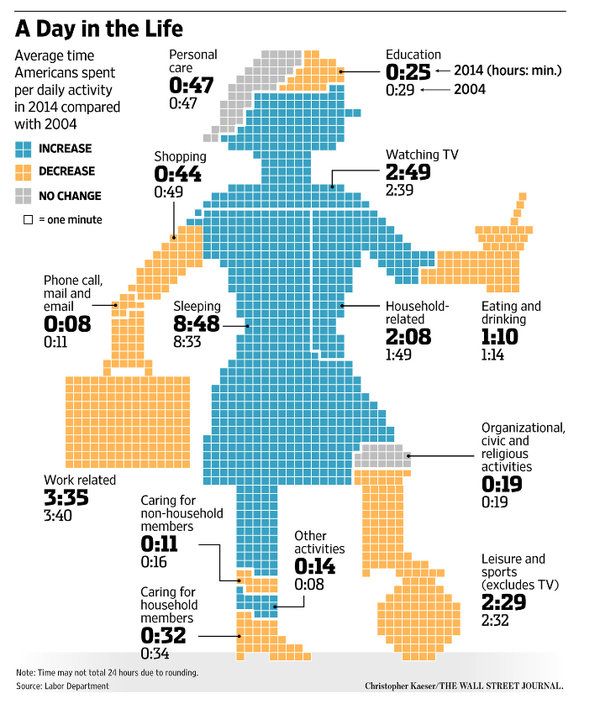 Wall Street recently jammed the stock up on growth in youtube: Again sedentary entertainment. Apple and Microsoft can be argued are part of the enabler group by either providing the devices or software making it all happen. Of course gaming is an entire additional category of sedentary entertainment keeping people in front of screens and $MSFT is a big player in this industry as well. What the impact on culture and society will be in the long term cannot not yet be clear, but behavior is changing rapidly. 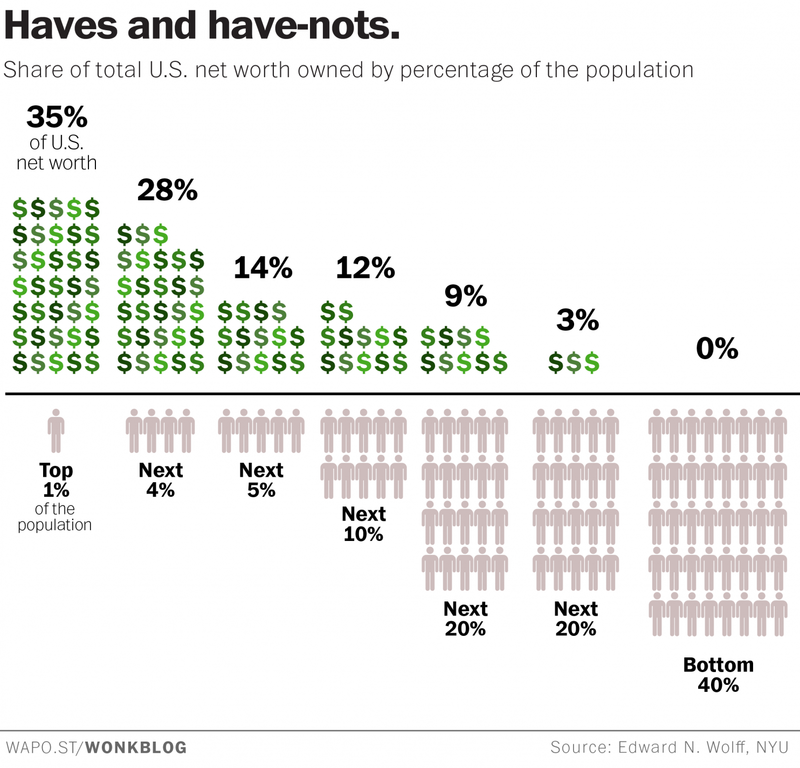 To summarize: We have society at large growing in waistlines, but not in incomes, wealth or jobs, benefits or security. We have witnessed the largest expansion in debt in modern times financed by artificially low rates and precious little evidence of organic and structural growth in the system. It won’t change and will only continue on its current trend. Why? On the one hand who can blame them. 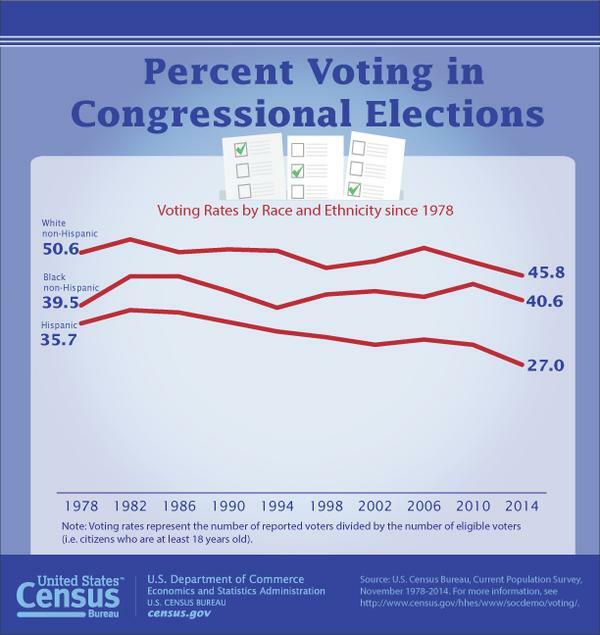 Aside from social issues perhaps does voting make really make any difference? The trends above suggest not. In the House, we counted 390 incumbents who ran on Election Day. Of those, four haven’t had their races called as of Nov. 10, so we’ll set them aside. Of the remaining 386 incumbents, 373 won, for a winning percentage of 96.6 percent. 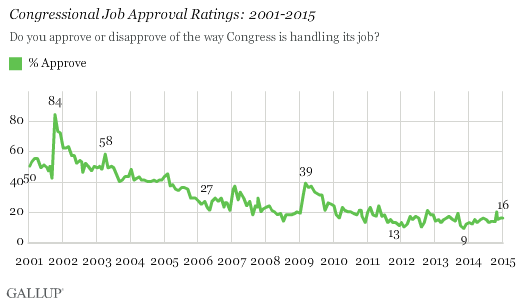 16% approval rating and a 96.6% re-election rate. There. Democracy. Somewhere Putin must be smiling. 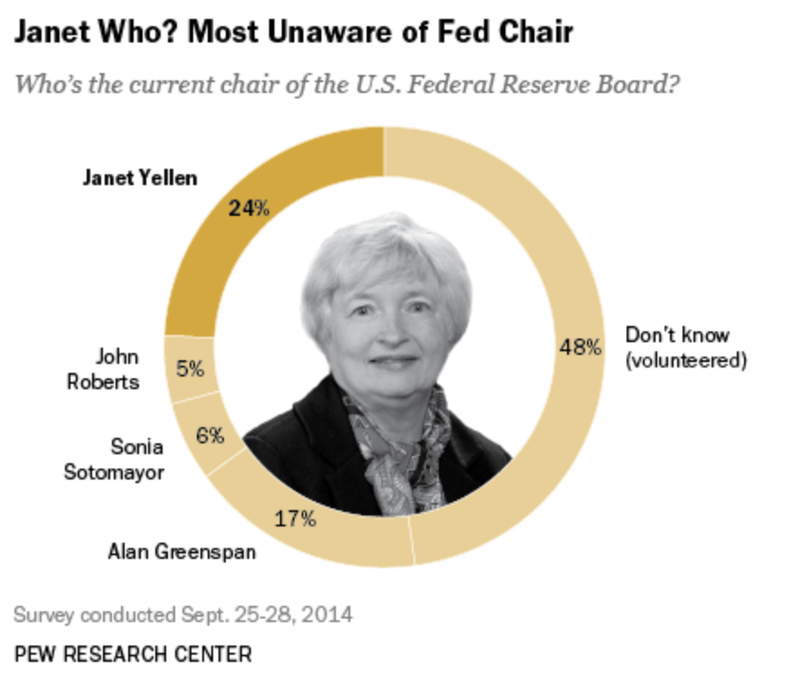 Yes, it’s somewhat depressing, but then Americans have zero input on the Fed, who runs it, or what they do. And this is the truth for all central banks. The world is run by big institutions and central banks none of which are democratically elected (think IMF, ECB, PBOC, BOJ, etc). And I understand this may never be a practical possibility given the complete focus of the electorate on entertainment and not education. But let’s acknowledge that we have democracy on paper only and only an illusion of choice. So there you have it. 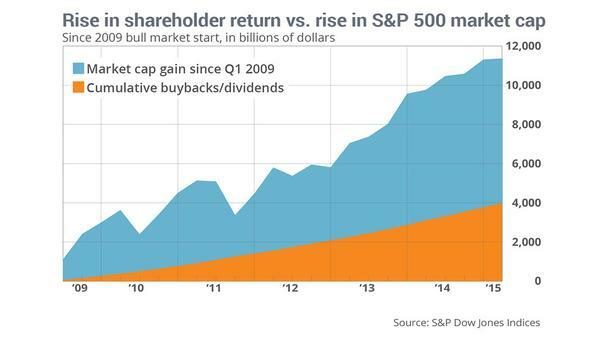 Facts, numbers, trends all pointing to a picture not exactly compatible with an ever expanding bull market. Quite the opposite. What all these data sets point toward is a structural malaise that has been masked by debt and zero interest rates. Janet Yellen is now talking about wanting to “gradually” increase rates. Best of luck with that. I submit that all the data above points towards a structural bear case that is already in play, but masked by years of debt increases, QE programs and ZIRP policies. And it’s not limited to the United States, technology is global and so are its impacts. Companies can do more with less. Fewer employees that is and pay less overall. And without a new impetus of growth this trend will not change, but only accelerate. Each time unemployment reaches the 4-5% mark history suggests we get hit by a downturn and companies will lay off people by the millions. And we all know they will again. They do it even during supposed good times. Microsoft, Barclays, Qualcomm, etc. are already laying people off by the tens of thousands. So what can the individual do? From my perspective people need to make a fundamental choice to the extent that they can do it: Take control of their own destiny. Decide whether they want to be serfs or in charge of their own future. The reality is this: One cannot rarely achieve independence working for someone else. Jobs are not secure, there’s no loyalty toward employees and jobs are fragile. Our family has landed in the world of trading and we are very fortunate that this choice has allowed us to lead a life of independence. And this is the bright side of technology: It gives each individual the opportunity to reach a global marketplace with a product or service idea and partake in the flow of capital and create their own financial freedom. Whether it cracks in the weeks to come or whether the construct can be maintained for longer is almost secondary to the end conclusion. My only hope is that eventually we can do better with all this technology available to us, but I suspect we won’t until we can have an honest debate about what is actually happening to society. Hopefully this article makes a contribution to that end.